This week, we are pleased to welcome Jim Crawford to the podcast! 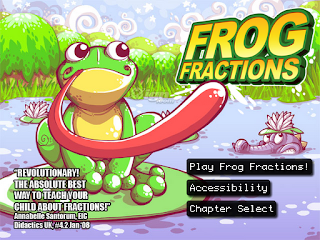 Jim is a game designer whose latest work, Frog Fractions, teaches us all about the hidden wonders of math. Well, it actually does a lot more than that, but you really owe it to yourself to play it (it's free!). Jim was kind enough to come on the show and chat with us about everything from design philosophy, the role of nostalgia, and the legend of the Twin Beard. We hope you enjoy it and thanks for listening!